Although Charlie Chaplin’s “Little Tramp” character remains so iconic, people all over the world are still familiar with it, even if they have never seen a Chaplin film. That had been the case with me up until 1993, when I saw the restored, original version of The Gold Rush (1925) during a PBS pledge drive. To put it mildly, I was blown away. The storytelling, the inventiveness of the shots, and above all, the charisma of Chaplin himself just knocked me out. For a silent film to retain such remarkable power all those years later clearly indicated that the legendary status Chaplin had long been accorded was well-deserved. So when I heard that The Gold Rush was to be given The Criterion Collection treatment, I was excited to say the least. Nobody does a better job with classic films than Criterion. With The Gold Rush they have once again come through in spectacular form. The first surprise for me was that this edition contains two versions of The Gold Rush. Call me uninformed, but I was not familiar with the “updated” 1942 adaptation that Chaplin had created for re-release. The original 1925 film was one of the most successful silent films of all time. United Artists was a studio founded by Chaplin, D. W. Griffith, Mary Pickford, and Douglas Fairbanks in 1919. In 1942, the studio was in trouble, and in a move to raise some cash, Chaplin hit upon the idea of re-releasing The Gold Rush. He knew that in 1942, a reissue of a 17-year-old silent film would not really fly, and so he did what we would today call a “re-boot” of the film. He wrote and read a narrative, composed a new score, and edited the movie from its initial 88 minutes down to 72. Chaplin considered his 1942 version of The Gold Rush to be definitive. So much so that he ordered the 1925 edition to be destroyed. In 1942, the idea of film history, and of archiving material was not yet a consideration. This is what made the eventual restoration of the 1925 film so difficult, and such an event when it was finally accomplished. Maybe if I had seen the narrated 1942 update first, I may have a different feeling towards The Gold Rush. But for me, the definitive edition is the silent one. In my slow process of becoming a “cinema geek,” seeing the original 1925 The Gold Rush was something of a watershed moment. It helped me to understand the art of silent film, and to move past my former bias towards them. One has to “work” a bit with silent films. It is such a different experience to allow the images to (for the most part) speak for themselves. This extra bit of effort also helped me in more fully embracing foreign films. They too force the viewer to more deeply engaged - by watching the picture more closely, and reading the dialogue. 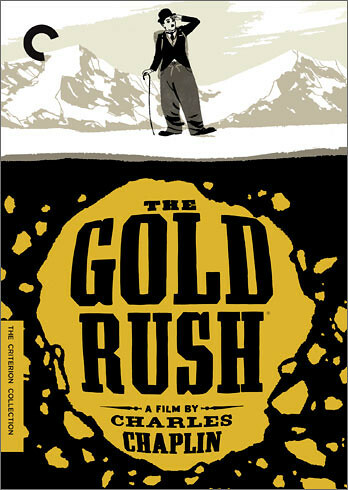 Thankfully, the Criterion Collection of The Gold Rush includes both the 1925, and 1942 versions. No matter which one you prefer though, The Gold Rush is deservedly one of Chaplin’s most acclaimed films ever. For one thing, it contains a number of scenes which remain remarkable examples of filmmaking at its highest level. One is the famous bit where Chaplin boils his boot for dinner. He and his friend Big Jim (Mack Swain) are starving, and it is all he can come up with to cook. After this unsatisfying meal, Big Jim hallucinates Chaplin as a giant chicken, and almost kills him. The technical expertise in making our hero become a chicken then switch back is a marvel, and was state of the art at the time. Rather than simply cutting away, and having The Little Tramp re-appear in the next frame as a chicken, Chaplin actually appears to transform right before our very eyes. Another brilliant bit is when the cabin that Chaplin and Big Jim occupy gets pushed to the precipice of a mountain during a storm. Again, the techniques employed to create this illusion were incredible for their day. Then there is one of the most magical moments in film history; “The Dance of the Rolls.” Robert Downey Jr. did a nice re-creation of this in Chaplin (1992), but nothing can compare to the original. The two versions of The Gold Rush comprise the first DVD, while the second is devoted to supplemental material. Of these I found the 27-minute "Chaplin Today: The Gold Rush" (2002) to be the most illuminating. The piece includes interviews with Georgia Hale, Mary Pickford, and filmmaker Idrissa Ouedraogo, and offers a thorough account of the making of the film. "Presenting The Gold Rush" is a 16-minute piece featuring filmmaker Kevin Brownlow and Chaplin biographer Jeffery Vance discussing the film. Rounding out the second DVD are the self-explanatory "A Time of Innovation: Visual Effects in The Gold Rush," and Music by Charles Chaplin." Criterion always includes a booklet with their releases. These generally include essays by noted film scholars, in the case of The Gold Rush, the essay “As Good As Gold” was written by Luc Sante. The real treasure here though is the reprint of the Time magazine review of the 1942 reissue of The Gold Rush, written by none other than the famous author James Agee. The Gold Rush is a masterpiece, without question. Some fans prefer City Lights (1931), and some swear by Modern Times (1936), among others. But this is just a matter of personal preference, academic in the end. But for the sake of argument, I stubbornly stick by the restored 1925 silent The Gold Rush. I think that all fans can agree upon one thing though, this Criterion Collection edition is the best home-video presentation of The Gold Rush ever.